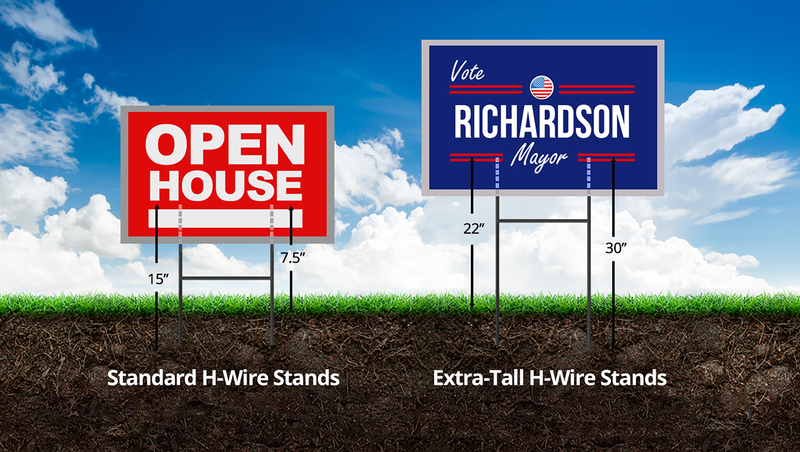 We offer two sizes for our h-wire stands for yard signs. The standard H-wire stand is a 15″ galvanized metal stand for attaching your yard sign to your lawn. Once staked into the earth, it stands 7.5″ above the ground. If you need a taller stand, our extra-tall H-wire stand is perfect for you. It is a 30″ galvanized metal stand, double the height of our standard H-wire stand. After staking it in your lawn, it stands 22″ above the ground, with a 14″ clearance from the base of your yard sign to the ground.